As a pirate, Blackbeard would have been very aware of his need to be well armed. It was all well and good to catch another ship, but if you couldn’t overpower them your career as a pirate would be short and unsuccessful. When it began its final voyage, La Concorde was armed with only 16 cannon; enough to mount a token defense with a healthy crew, but not a heavy armament by any measure. How then did Blackbeard use such a lightly armed ship? Simple: he added more guns. Archaeologists have found 30 cannon so far when excavating Queen Anne’s Revenge, and historical records indicate the ship may have held 40. This made the ship a fast, relatively heavily armed ship, excellent for catching and overpowering merchant vessels – in short, an ideal pirate ship. 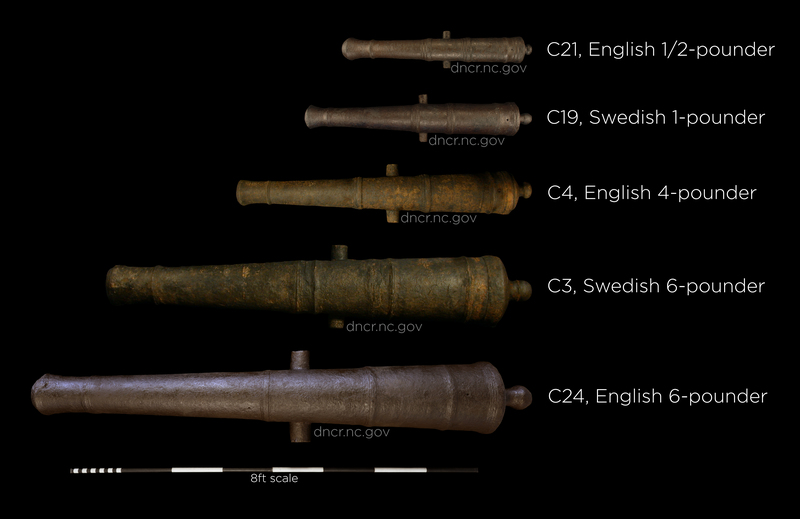 The cannon which archaeologists have found on Queen Anne’s Revenge are quite a mixed lot. Fortunately, cannon are often marked with letters or numbers which help identify them. 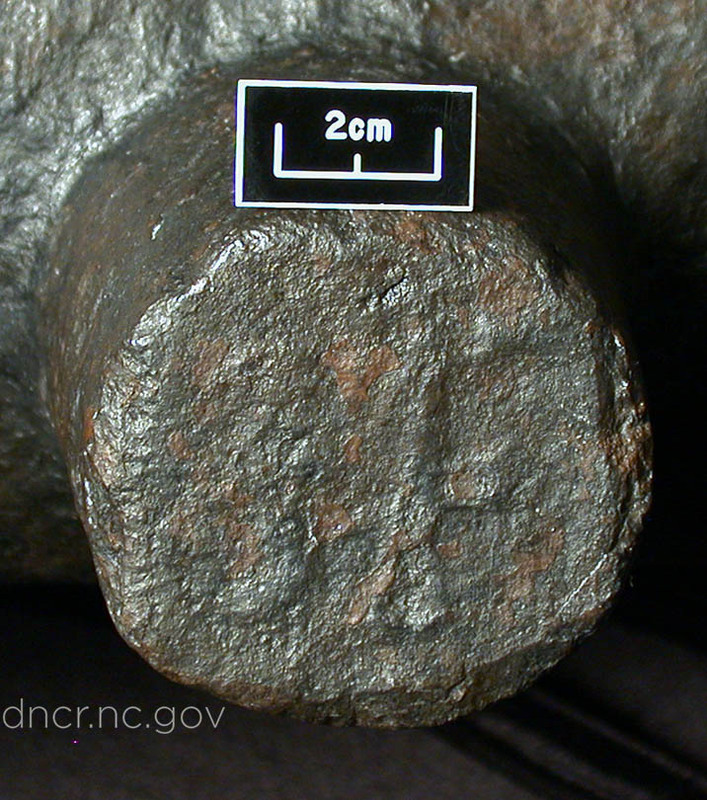 These may be date marks, maker’s marks, proof marks, weight marks (heavier guns were better quality), or marks indicating ownership. Marks are most common on the ends of the trunnions, the top of the first reinforce, and the vent field, and they help to identify who made a cannon, when, and where. For example, cannon C4 is marked “IF” on the end of the right trunnion, and has the letter “P” and the gun’s weight engraved on the first reinforce. The mark IF indicates the gun was made by John Fuller of East Sussex, England, who headed Heathfield Furnace from 1652-1722. The date range can be narrowed further to approximately 1690-1715, as it follows a 1690 English naval design. The “P” mark indicates the gun was proofed by the English authorities to make sure it was safe. So far, ½-pounders, 1-pounders, 2-pounders, 4-pounders, and 6-pounders have been found. These do not indicate how much the gun weighs – a cannon actually weighing half a pound would be tiny – but rather how much the cannonball fired by each gun weighs. The effective range of these weapons was quite short. The ½-pounders and 1-pounders were likely only useful as at extremely close range immediately before boarding an enemy ship, while the larger guns could be used at several hundred yards to damage an enemy ship.